Pope Francis “knows that he is taking a risk” by visiting the Central African Republic, “but he is going there as a sign of love and esteem and this is a very powerful message,” Cardinal Francis Arinze told me in an interview on the eve of the pope’s departure for Africa. 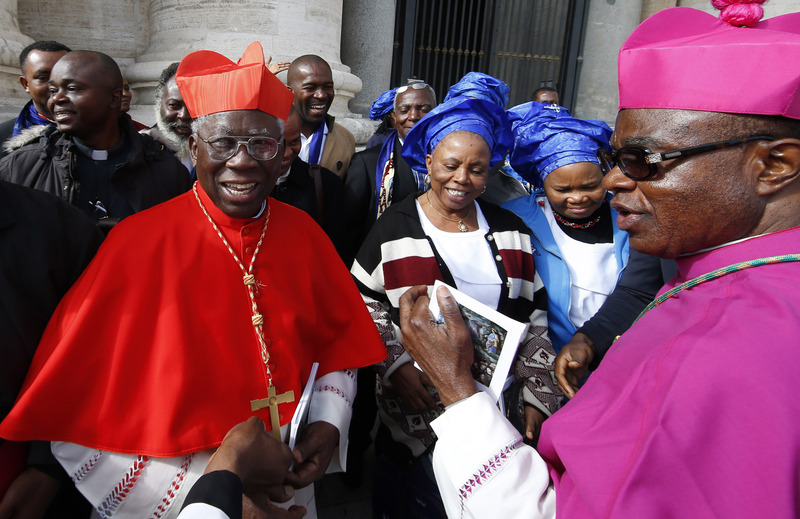 At the same time Arinze, the most senior African cardinal in the Vatican, believes it is worth taking this risk and says Francis' presence and his appeal for peace in the city of Bangui will be something very powerful indeed. He spoke about this and also discussed the significance of Francis’ first visit to Africa (Nov. 25-30), a country where the church is growing more than in any other continent, and what it means for the other two countries he will visit—Kenya and Uganda. Pope Francis is going to the Central African Republic where there is much insecurity and peace is still not a reality. What do you make of this? He knows that all is not well there. He knows that he is taking a risk, but he is going there as a sign of love and esteem and this is a very powerful message. That he is willing to go there is a sign of his love for the people of Africa; and that he will make an appeal to everyone to accept one another, discuss differences and not to resort to violence is very important. Even though he has been saying this in Rome in these years, it will be very powerful when he says it in Bangui. If you were asked would you tell him not to go? You are asking me to do the work of the security people! I would be undertaking too much if I were to advise him to go or not to go. I do not regard myself as guarantee of security. Then it isn’t just the pope but all the people too, and I cannot fail to thank the pope for his willingness to take a risk. Do you think it is worth his taking such a risk? How significant is his visit for inter-religious relations in this country? I think it is very important. Although the majority of people in the Central African Republic are Christians and the Muslims are a lesser number, and there are also people of traditional religion, the fact that the pope is there is already an eloquent appeal to Christians and Muslims to meet together, to listen to each other, to hold hands and to build up their country together and not allow any extremists to scatter them. Their main problem is not religion; they should accept one another and the pope going there gives that message without words. What then do you see as the main problem? They have to accept one another. There would have to be less foreign interference with the people and more good will from the outside world to see this poor country succeed. What do you make of the fact that he is going to open the Holy Door in the cathedral of Bangui even before it is opened in the Vatican? It’s very encouraging, knowing that this is a country that is suffering. This is a country where there is a lot of tension. The Holy Father is the pope of mercy and it is the Jubilee of Mercy and he now decides nine or 10 days before to open the Holy Door there, it is a great favor to this country and we must thank the Holy Father for that. How do you read the visit to Kenya? I see it as very encouraging, too. Every country has joys and sorrows, including Kenya. For decades, Kenya has been a sign of stability in Africa, but of late it has also experienced outbreaks of violence, some of it very painful, so the Holy Father going there encourages them and not just the Catholics. He encourages the society. He encourages those in political office to sit together, to work together, and to regard whatever differences may exist between them as ones that can be overcome peacefully. So I think his visit is very positive. With his visit it isn’t like the tourists who go to Kenya to see the wild animals, it is the church focusing attention on Kenya. This is a beloved country also for conferences in Africa; it has institutions of the United Nations, of the church, of academia. So his visit is very important. Uganda, on the other hand, is a country that wasn’t so stable in the past. That is true. It has experienced more difficulties than Kenya. Nevertheless, we Africans never forget that Ugandans gave us the African martyrs; those 22 who were put to death for the faith between 1885 and 1887. I remember when Paul VI went there in 1969, I was happy to have been there then; he made history in Namugongo. So we never forget that Uganda is number one as a country that gave us those martyrs. I don’t say there were no other martyrs in Africa before that—there were, of course, martyrs in the early church in North Africa—but these were the first in modern times. Uganda has its constitution and political development. And remember that too many African countries have had too much interference by the military in government, but Uganda has not had so many. My own country Nigeria has had more, the break-up by armies of constitutionally set up governments. So the pope going to Uganda is also very important. This is Francis’ first visit to Africa. How significant is it? It is important because Christianity is growing in Africa more than in any other continent, and although there are difficulties in Africa—interracial, political, economic—it is a fact that Christianity is good news in Africa. People are responding. People are making sacrifices: young men are becoming priests, monks, brothers and young women are becoming sisters, and it is not just religious but also the lay people. In my own country, Nigeria, I admire the lay people’s commitment to our faith, to Christianity. So for the Holy Father to be in immediate contact with this continent is good news. The Holy Father hasn’t had enough possibility in the past to be in Africa, this will be his first live contact in an African country, although he has seen Africans elsewhere it is not the same as visiting there. You remember that John Paul II went to Africa 14 times (some say even 16 times), so it makes a big difference. It isn’t just the pope who is coming, it is also those who accompany the pope, including the mass media, journalists who inform people on the world stage and who are with him, they have an important role; they focus world attention on the places he visits, so it is very important. What would you like the pope to say during his visit in Africa? I hope he will encourage the effort of the peoples of Africa to build up their countries in matters social, economic and political, and to overcome inter-ethnic differences which are real in Africa. I hope he would also encourage the people to watch that a few persons don’t channel the riches out of their countries for their personal benefit but that they keep what riches they have and use these for the common good. I would expect the Holy Father, therefore, to encourage efforts on the positive side, efforts at economic, social and cultural development. Obviously, the Holy Father will encourage the church, the ministers of the church and the lay people to continue to contribute to the missionary effort of the church within Africa, between African countries and also beyond. Happily many young people are coming to our seminaries. Are vocations still growing in Africa? Yes, but not equally in each country, so we must not generalize. Also where the seminaries are full, with some 400 seminarians, the challenge is formation. Although we would like to have many priests, many religious, quality is also important and it is not easy to balance both quantity and quality. This is the challenge; it is not insuperable, but is one that should be met openly with encouragement from the universal church. Do you see the lay people in Africa taking a greater role in the years ahead? A cleric, whether bishop or parish priest, has nothing to fear from the lay person who is up and doing and who can deliver the goods. These lay people need great encouragement through theological formation because they are already doing much. The clergy should be happy that the lay people are up and doing, but in some cases this is lacking; there is hesitation on the part of the clergy lest lay people will set up a parallel church. The synods on Africa described the church as ‘a family.’ Is this still the dominant concept of church in the continent? This concept remains valid and the bishops of Africa continue to use it. It is a healthy concept because in the family there are many members and each one has a role—father, mother, sister, brother and so on, and none of them eliminates the other, none of them is a threat to the other, or at least need not be a threat. This is something very attractive in the concept of family. What about the role of women in the church in Africa? The role of women is still growing in the church in Africa and it is to be encouraged because the women in Africa traditionally did not have as much esteem for their status as Christianity sees is necessary. So Christianity is one of the elevation messages for women and that should continue. Indeed sometimes women succeed where men do not. I remember you had women in the seminary in the 1970s when you were bishop in Onitsha. Yes, I put them on the board of the seminary and some priests asked me why. I replied that Catholic women know a good priest when they see one, and sometimes they know when a priest is not performing well, long before the bishop realizes it. So they see that the church is all of us, they see they contribute and it worked out very well. How is the pope seen in Africa? Africans love the pope. They don’t challenge the pope, they don’t fight the pope and they don’t look on the pope as anything but father; they see him as father of all. That is in general. But what do they think about Pope Francis? I’ve been away too long from Africa. I’ve been in Rome now for 31 years so I must not generalize. Maybe Africans would want Pope Francis to be more assertive in some areas of doctrine; they would want him to come clearer on some points. But they are very happy that the pope preaches a Gospel of mercy and forgiveness. They find his lifestyle attractive, definitely, because the temptation to materialism is strong in Africa and doesn’t spare even the clergy. Then you see the pope’s car when he visited the United States; we saw on television that his was the smallest car on the road; that was a message stronger than words. And we all know that it’s not just his car, it’s also where he lives. His lifestyle is much humbler than many would think or expect. He’s the fourth pope to go to Africa. Yes! Paul VI, John Paul II, Benedict and now Francis. Francis is the first pope from the southern hemisphere. Is this significant for Africans? It is significant and it is very healthy because it helps everyone to see that the Catholic Church is universal. It is not a European church, it is universal. God bless Cardinal Arinze !